Playoff basketball is finally coming to Fiserv Forum. 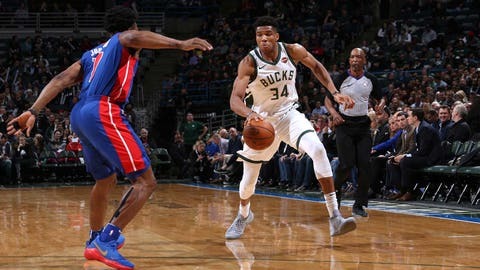 The Milwaukee Bucks will host Game 1 of a first-round playoff series with the Detroit Pistons on Sunday at Fiserv Forum at 6 p.m. The series continues Wednesday with Game 2 at 7 p.m., before the series shifts to Detroit for Game 3 and Game 4 Saturday, April 20 and Monday, April 22. Should the series continue, the Bucks will host Game 5 Wednesday, April 24, followed by Game 6 in Detroit Friday, April 26 and, if necessary, Game 7 in Milwaukee Sunday, April 28. It’s unlikely to take that long. Milwaukee swept its four-game series with Detroit this season. The Bucks closed out the regular season Wednesday with a 127-116 loss to the Oklahoma City Thunder, but enter the playoffs with the NBA’s best offense at 118.1 points per game. Detroit survived a three-team battle for the No. 8 seed during the final week of the regular season, holding off the Charlotte Hornets and Miami Heat with back-to-back wins over the Memphis Grizzlies and New York Knicks.